Son God - I'm not really Stanley Lieber. I still like this album and I refuse to make excuses for it. This has been sitting in a box for nine years, it will be here when you get back! Your earlier works have some kind of humour in them in my oppinion. Perhaps because you wheren't a pro with all kinds of gadgets back then. 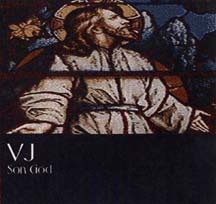 Up until about 2003 I was doing all my music under the name 'INRI' or 'Virtual Jesus,' which is referenced on this album. It was a whole different trip. Looks like we really need a "Stanleylieber inerview part 2". If you have stuff you want to ask me I'm game. I have nothing particular right now, I have an interview with Dzima that is soon ready to get up. Dunno when though(Thanks to school, argh!). What here could use excusing? So you've grown more confident with all the positive feedback? I'm not sure what zapped the initial upload of these tracks. By process of elimination it must have been the Creative Commons upload client. I followed the exact same steps (minus the Creative Commons upload client) and now the MP3s are accessible by everyone. This post is identical to the first one (now removed). Although I have to say it is kind of interesting to see what people think about this old stuff. At the time it was made no one I gave it to would even comment. I couldn't tell you what I think the problem was. I have a bunch of special, rare, and i****** applications and codecs on my computers, which help bypass incompatibility problems. For the most part, I try not to use either microsoft or macintosh software, when I can get away with it. This is great for the receiving end. But probably, if I was producing stuff for other people, they would have trouble playing it. By the way, thanks for your comments on the other thread. It's great that someone has finally listened to this stuff. Thanks. I sure wish I hadn't lost the lyrics to 3. Evidently the Creative Commons publisher client inserts the metadata in strange places. Everything is encoded at the same bitrate this time but I agree, it sounds better now. I liked this a lot. The lyrics are quite good! It is a signpost of our age that I cannot determine if you are being sarcastic or not. One has to be ever vigilant!